Hillary Clinton spoke during a campaign rally in Ohio earlier this month. 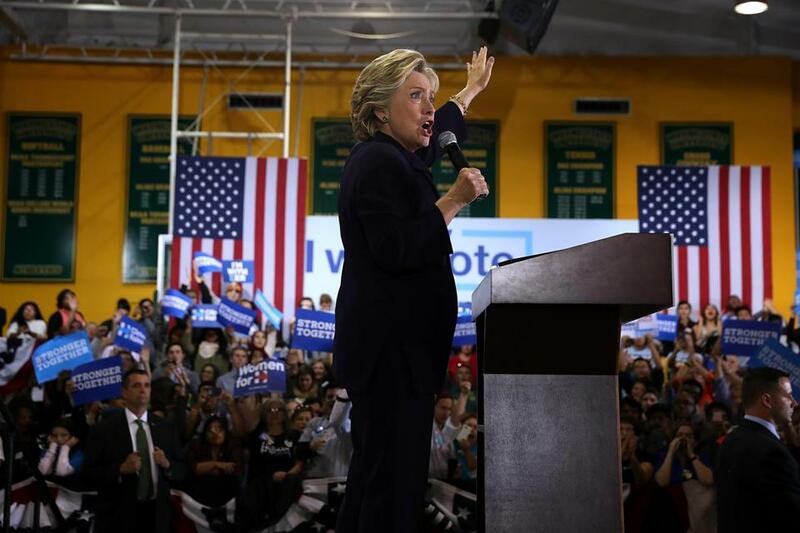 PHOENIX — Hillary Clinton has grown so confident, she is working to expand her goals beyond merely defeating Donald Trump and is now trying to flip Arizona and other traditionally Republican states to generate a broader Democratic victory in November. Handed a Republican opponent whose erratic debate performances and other flaws are dragging him down in the polls, the Democrats are working to build an electoral wave that would counter Trump’s talk of a “rigged’’ election and perhaps even award Clinton bragging rights to a mandate. Clinton appears to have all the momentum heading into the final two-week sprint before Nov. 8, enjoying a solid lead in national polls and most of the traditional swing states, with the notable exception of Ohio. 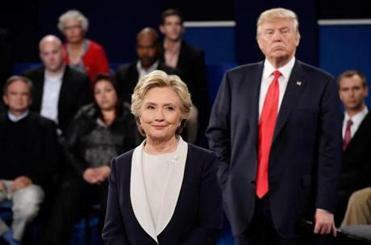 Trump squandered what may have been his last chance to shine on the national stage Wednesday when he refused in the final presidential debate to say whether he would accept the election results. Clinton forces are attempting to make incursions into Utah — which GOP nominee Mitt Romney won by 50 points four years ago — and even hope to make headway in Georgia. 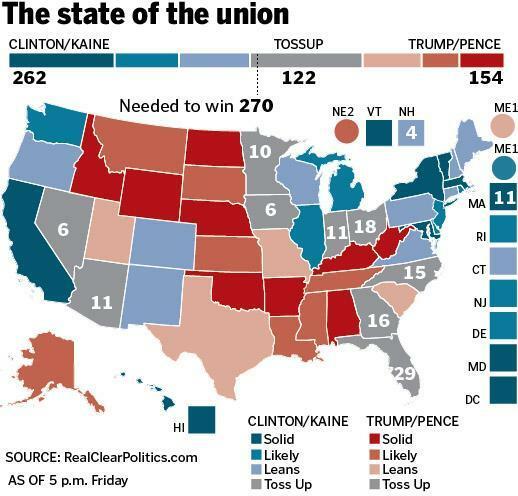 Because of Hillary Clinton’s recent rise, some traditional Republican states may have closer-than-anticipated contests. Perhaps the biggest symbol of their confidence is Arizona. Democrats believe a win in the crucial border state, where Hispanics are the fastest-growing segment of the electorate, could accelerate favorable trends they did not expect to solidify until perhaps 2020 or 2024. A poll released on Wednesday showed Clinton with a 5-point lead in Arizona, something nearly unthinkable in recent elections. The survey, conducted by the Arizona Republic, showed Clinton with 39 percent, followed by Trump with nearly 34 percent. Nearly 21 percent said they were still undecided. The Arizona Republic three weeks ago endorsed Clinton, the first time the newspaper had backed a Democratic presidential nominee in its 126-year history. Grant Woods, a former Republican attorney general and longtime McCain confidant, has also endorsed Clinton. Aside from a narrow win by Bill Clinton in 1996, Democrats have not carried Arizona in a presidential contest since 1948. Romney won the state by 9 points in 2012. Democrats have long held out hope that Arizona would be a state they could turn blue. The Clinton team toyed with making a push there early in the campaign only to decide the risk was not worth the resources. Now, late in the game, it suddenly seems like a state in play. The reasons for their optimism are not only Hispanics — who make up almost a third of the population — but also Mormons, who have been turned off by Trump’s brash behavior and past lewd comments. Mormons, who usually are reliably Republican, make up 6 percent of the population in Arizona, one of the highest concentrations in the country. Clinton has been weighing whether to visit the state in the final days of the campaign. She dispatched Senator Bernie Sanders to Arizona on Tuesday and her daughter, Chelsea, on Wednesday, and first lady Michelle Obama campaigned in Phoenix on Thursday. After being introduced by Carolyn Goldwater Ross — the granddaughter of 1964 Republican presidential nominee Barry Goldwater of Arizona — Obama took the stage to wild applause in the same arena where Trump two months ago delivered a hard-line immigration speech. Without ever mentioning his name, she tore into Trump’s philosophy, his background, and his world view. “Maybe with so little exposure to people who are different than you, it becomes easy to take advantage of folks who are down on their luck,” she said. Democrats are hoping the activity will help down-ballot candidates, and they are reveling in the newfound national attention (“I’m so proud to be here today and say: We are officially a swing state!” said Representative Ruben Gallego, an Arizona Democrat). The marquee race is Republican John McCain’s attempt to win a sixth term in the Senate, with a challenge from US Representative Ann Kirkpatrick. McCain helped unleash the civil war in the Republican Party with his pick of Tea Party favorite Sarah Palin as his 2008 running mate, and he has been buffeted by big shifts in the party. Once viewed as vulnerable, he is now leading by 16 points, according to the latest average of polls. McCain withdrew his support of Trump after a videotape emerged of Trump bragging about groping women. McCain on Thursday also rebuked Trump for his unwillingness to say he will accept the results of the election. Democrats are also hoping to defeat Sheriff Joe Arpaio, the anti-immigration firebrand who Trump has held up as a chief validator for his calls for a tighter border with Mexico. Arpaio is running for reelection in Maricopa County, which includes Phoenix. He trails his Democratic opponent by 15 points in the recent Arizona Republic poll. Republicans reject the idea that Democrats are making inroads. Boris Epshteyn, a senior Trump adviser, laughed when asked about Arizona. Sean Spicer, the chief strategist for the Republican National Committee, discounted the Democrats’ push. Brewer, the state’s former governor, said immigration is such a big issue in the state that many voters will be receptive to Trump’s mantra of building a wall with Mexico. Matt Viser can be reached at matt.viser@globe.com. Annie Linskey can be reached at annie.linskey@globe.com. Follow her on Twitter @AnnieLinskey.